DETROIT: It’s getting better all the time…. These days it seems a new restaurant is opening in Detroit every couple of weeks, as dutiful citizens we must do our part to patronize these independent establishments. I mean if somebody goes through all the trouble to open a place, the least we can do is eat there, right? 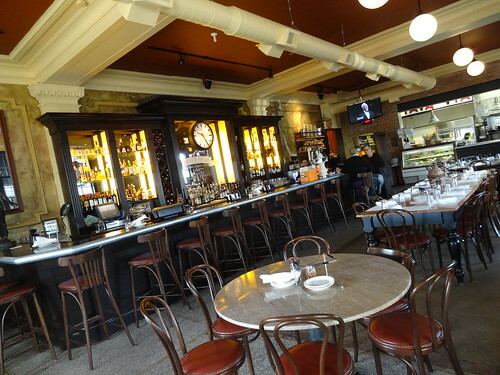 Today we are having a late lunch at Ottava Via on the corner of Michigan Ave and 8th Street (hence the name). Open just a short time, we are anxious to give it a try. 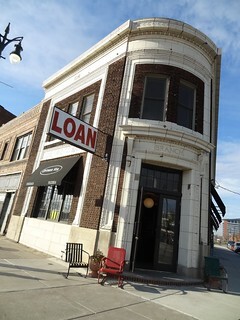 The building itself was built sometime in the early 20th century, brown brick and white terracotta, it began life as the Dime Bank, did time as a bakery and before its current reincarnation was a pawn shop, the red-letter LOAN sign is still attached to the building. The inside has a rustic charm, architectural elements are a mix of vintage and contemporary; terazzo floors, high ceilings, communal tables and a gorgeous clock add to the atmosphere. The menu features Neapolitan style pizza baked in a stone oven, antipasti, share plates and pasta dishes. Our meal arrives quickly, the chopped salad is delicious; the greens are fresh with some crunch, the basil is a nice touch, meat is thinly sliced in bite-size pieces. 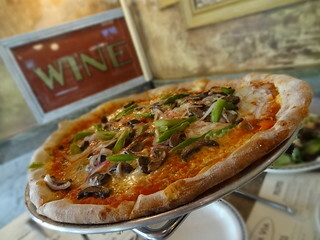 The vegetarian pizza is flavorful, the crust Neapolitan-style thin, toppings include mushrooms, asparagus, onion and olives laying atop a tasty red sauce, yum! A little way down Michigan Ave Two James Spirits, the first licensed Distillery to open in Detroit since prohibition, is serving handmade spirits in their very own tasting room. Kris and I have a seat at the circular granite bar, the bartender slides a couple of drink menus over and we have a look. Currently the selection of spirits consists of 28 Island Vodka, Old Cockney Gin and Grass Widow Bourbon, all are made in house. I order a vodka and tonic, Kris has something made with bourbon and Faygo Rock & Rye, the cocktails are excellent! 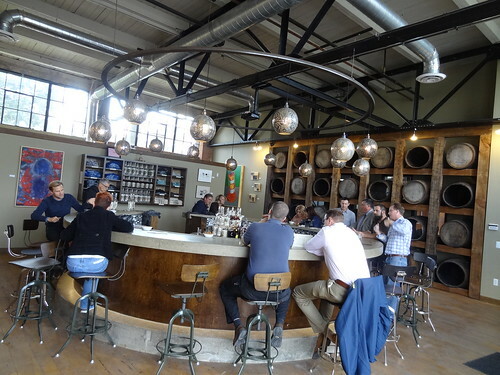 The space is really cool, old wooden barrels create a dividing wall between tasting room and distillery, metal globes dangle from a ring above the bar, colorful art decorates walls. The back wall displays bottles of spirits and T-shirts for sale, most patrons are purchasing a bottle to take with them. 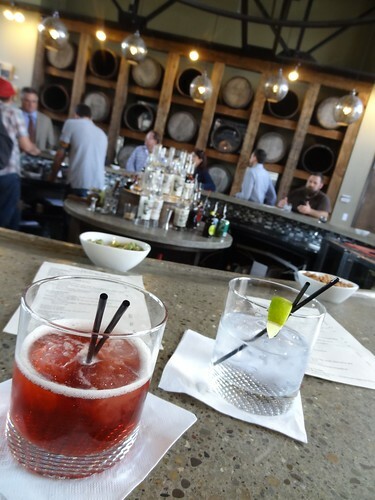 It’s a great place to enjoy a cocktail and lively conversation. 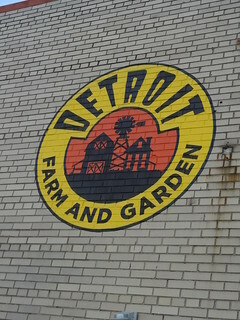 Next stop, Detroit Farm and Garden on 21st Street in Mexicantown. 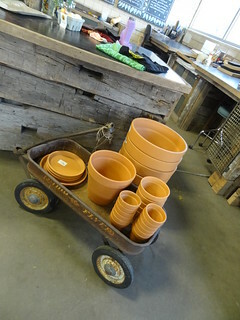 Located directly behind 555 Gallery, though it is not exactly gardening season, I love to stop in and see what’s going on at the store. 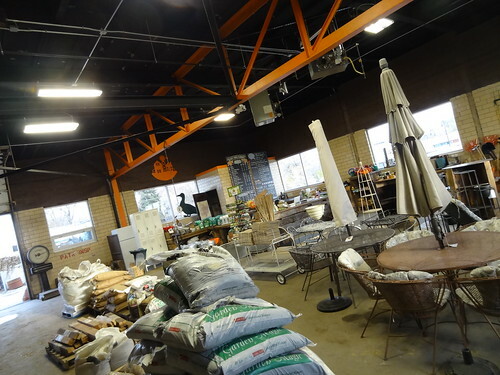 In addition to supplying bulk materials such as top soil, compost, mulch, sand, pea gravel and such to the local community, they offer a nice selection of tools, containers, seeds and fertilizer. 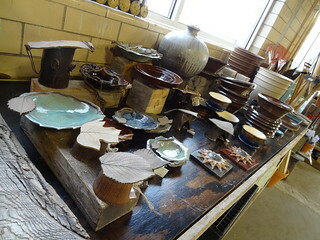 Antique and reclaimed furniture pieces are found throughout the space, other items for sale include body products, art, Slow Jams Jam and canning supplies. I check my watch, the gallery is open, time to go. Detroit has long been home to art of all mediums. 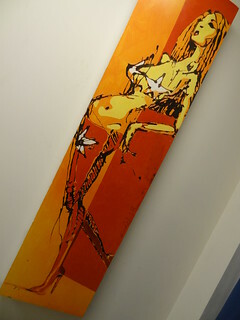 In the last couple of years the art scene in the D has gained notoriety throughout the country and overseas. 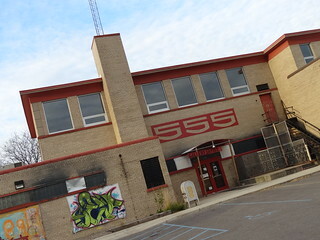 The 555 Center for Public Arts is a non-profit group serving both emerging and established artists. 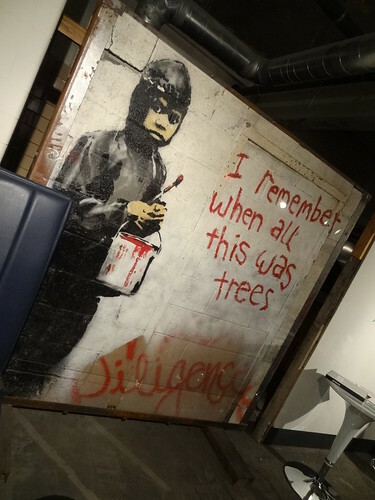 The current facility holds studio spaces for resident and renting artists, performance space, exhibition and installation space and an arts education studio, even an original Banksy piece from the old Packard Plant has been preserved and is on display. 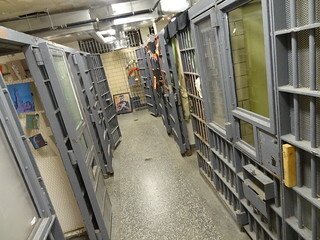 Oh yeah, the building is the former Detroit Police Department 3rd Precinct-complete with jail cells! Today we are exploring the “Eye On The D”, Seeing Detroit With New Eyes. 18 artists express what inspires them about Detroit, how they see the future of the city and what it looks like in their imagination; c’mon let’s have a look. Just inside the door people are gathered in clusters, beverages in hand, talking excitedly about the show. 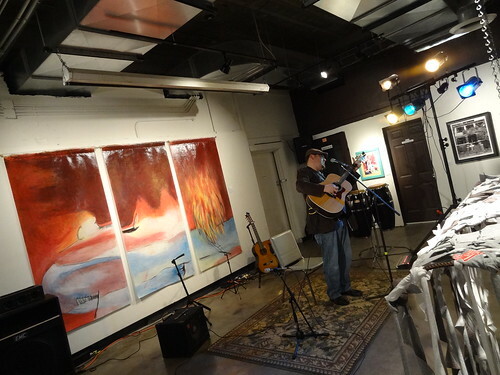 A folk singer is entertaining guests in the performance space; open mic’s are held regularly on the first and third Saturday of the month. 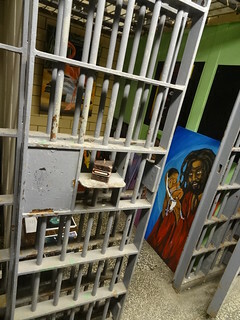 We avoid the crowd by taking a left, here jail cells are now rented out as studio space, very clever, some are fixed up as little boutiques. 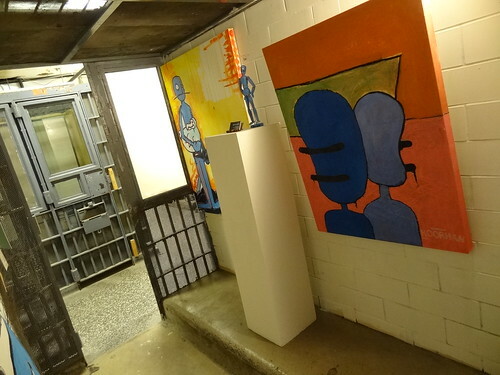 Wandering from cell to cell there is a great variety of things to look at; vintage apparel, paintings in oils and watercolors, drawings, photography, ceramics and handmade clothing. A curious group of crows line the floor along the back wall, some have wheels, air pressure gauges, keys and bells attached to them, there’s something about them that I like. 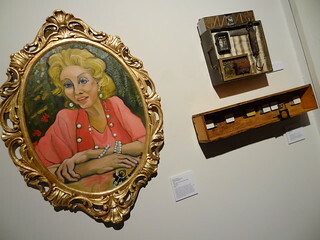 We cut across the back and find ourselves in the main exhibit space, the work is very personal; paintings, collages convey the artists emotions. 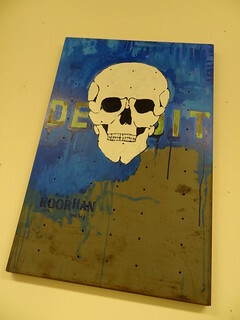 One of the featured artists is friend, fellow blogger and a favorite Detroit photographer Amy Sacka (http://www.owenwashere.com/). 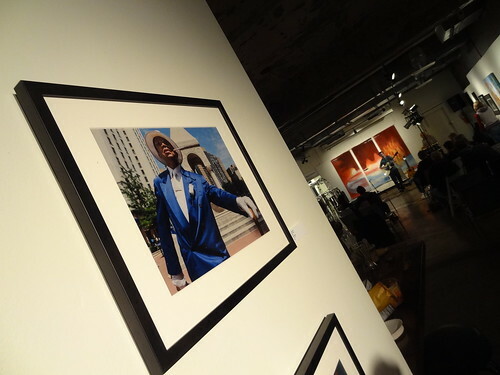 Amy has three photographs in the show, I am familiar with them, I saw their debut on the Owen blog. 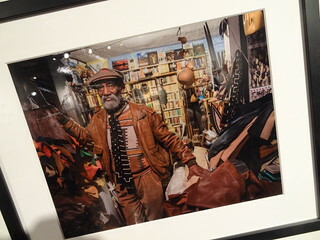 She has a way of capturing the spirit and electricity of the people in her photos, it’s like they are live images; Mr. Detroit is my favorite! 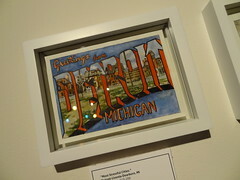 On the other side of the room an artist has created a series of vintage-looking postcards, each features a well-known image with the words “Greetings From Detroit” across the scene, captions are taken straight from negative headlines such as the bankruptcy. There is a cloth sculpture of a car, another one of a house, a video is projected onto the floor. 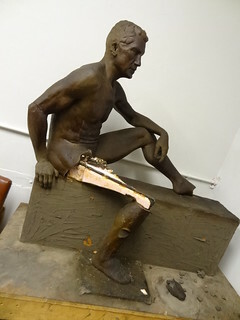 Near the back a sculpture studio is open to visitors, the work is so life-like we are amazed. 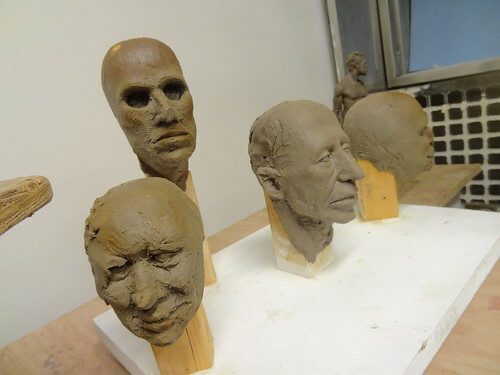 A group of heads on wooden blocks rest on a shelf, nearby a larger body waits for a head, the detail is incredible. A full size sculpture of a woman sitting in a chair will have you doing a double take. We browse the gallery one more time before calling it a night. The quality of art in Detroit is truly exceptional, and the number of places to see it continues to grow.